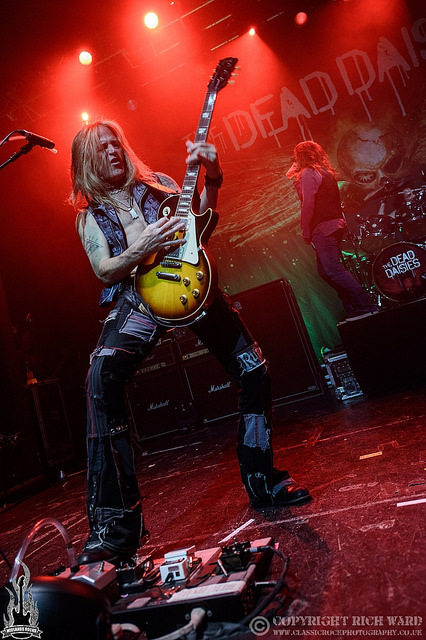 Midlands Rocks caught up with Doug Aldrich during the Dead Daisies visit to Birmingham’s O2 Institute to discuss recording and touring with the Dead Daisies and a new Burning Rain album due in the new year. MR Thanks for taking the time out to speak to us on this cold Birmingham night. DA It is cold but I think it’s getting better. London was quite warm but it was a cold night in Oxford and tonight is colder still. I guess it’s because we’re moving we’re moving North. MR It’s been a pretty long trek for you. I bet you’re looking forward to getting home. DA I love to play and I love to travel but it will be good to get back home to the kids. DA Absolutely. When you make a record you do your best, but you do it to make yourself happy, not to impress the press or to impress the fans. You do what you think is good. That’s the way to do it and if the fans and the press like it then that’s great. Sometimes with albums when there’s a lot of people involved with different opinons it can be difficult, but with this when it comes to the guitars I got to do pretty much what I wanted and keeping it as solid as I could. MR So what’s the process for writing with the Dead Daisies with you all living in different locations? DA We do get together to write. This year we got together in New York and wrote together in March. We wrote for about a week to ten days and got some basic riffs. For example John would bring in a basic riff (plays ‘Can’t Take It With You’) and we’d work it up into a Dead Daisies riff and from there you might go to a more technical part or to the chorus, or even singing over the top. We’d record it all as we go and have the rough melodies and phrasings on an iphone and before you know it, we’ve got 35 ideas. Then we get into the studio and go through them one by one and everytime one was getting close to being a full song, we’d record it. We’d then have maybe 15 or 20 songs that we felt were strong enough which we’d then whittle down to maybe 12. DA Yeah. everybody writes together, everybody splits everything. Nobody comes in with a full song written. We all come in with parts and we work on it. That way everyone is invested in each song. It’s a good way to work and the songs come together quickly. When I was working with David Coverdale, we’d write and work out all the parts and program the drum machine, work on the bass lines, the vocals and record all the parts so when we’d done a demo it was almost good enough to be on the album. With the Dead Daisies we like to keep it a lot more raw and try and capture the takes in the studio. It’s quick and you don’t have time to second guess yourself. MR Are there tight deadlines that force you to work quickly. DA We don’t really have deadline pressures, it’s just that the ideas are always flowing. 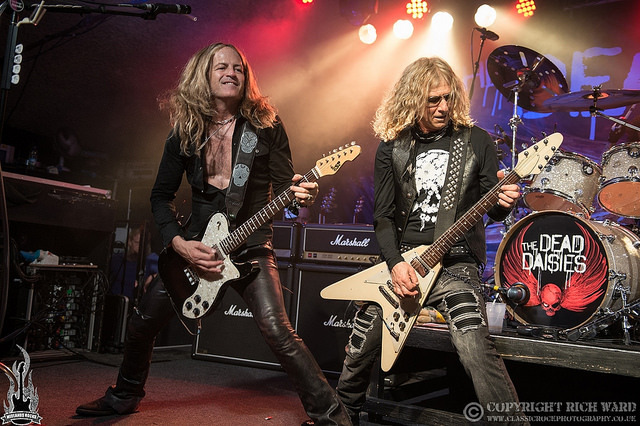 MR For you personally, when writing do you differentiate between writing for the Dead Daisies or Revolution Saints? DA I just throw out there the things that I think the guys might like at that point in time. If they like it, we’ll work on it and record it. It may not end up on the record, and it might be something that comes back later further on down the line. Usually with the Dead Daisies we talk about what we want. We wanted to make this record a little more diverse. So we wrote some heavier stuff like ‘Rise Up’ and ‘Resurrected’ and softer stuff like ‘Judgement Day’ which is one of my favourites off the record. MR The Dead Daisies have been described as a collective rather than a band, but it seems like a fairly settled line up currently. DA Yeah, it does feel stable, but at the same time people get busy. You never know what might happen. I’ve got a family at home, and while I love what I’m doing, if for some reason I needed to be at home, then the Dead Daises can call a number of different people and get them in. It’s kind of like a liquid situation where it can move and still be the Dead Daisies. We’re almost like a travelling circus! DA It’s nice because it’s a solid gig, and the people I play with are my friends. I’ve known John Corabi for years – we actually went to school together – but I’d never been in a band with him until now. Marco I worked with in Whitesnake and our wives are friends, and Dean I work with in Revolution Saints. With the guitars I tend to play lead and David, rhythm. It works well and we all get along. MR It’s been a good year for UK fans, having had the tour in April, summer festival appearances and now this tour with the added attraction of the Daisyland set. How did that come about? DA We wanted to do something a little bit different that was going to be special for this tour and we’re really enjoying doing it. It’s a lot of fun. I love playing the heavy stuff but I also really enjoy that because it’s free form and you can just do different things. It’s very refreshing and a refreshing way to see a band. MR …and followed up with a two hour set. That must be pretty demanding, especially for John? DA Yeah. John’s hanging in there. He’s one of the strongest singers that I’ve worked with. even Ronnie or David, they’d want to rest. David’s still got great tone, but this is a grueling schedule but John just ploughs straight through. He’s even just getting over a cold but you wouldn’t know it. he’s unbelievable. MR You have a few more dates in Europe before the tour winds up. Have you had any particularly memorable shows? DA Yeah. We played Oxford for the first time yesterday, and also Liverpool was great. I don’t get a lot of time to get out – we had a day off in London, but that was taken up with meetings and I’ve got a friend making a Christmas album who asked me to record some guitars for that, then we went out for dinner and then the day’s gone. I’d really like to bring my family to the UK soon to see some parts of the country. MR And what’s next for Doug Aldrich? DA Well, I get back to LA on 17th December so I’ve got to hustle to get ready for Christmas. I’ve got some sessions and different appearances in January and February. March I’ll be doing some clinics in Europe and the UK, and I’ve been working with a singer called Keith St John and we’ll be promoting a record that comes out March 24th called Burning Rain. I’ve never really had the chance to promote Burning Rain as I’ve always been busy with other commitments. The last Burning Rain album I released came out while I was in Whitesnake. Now I’ve timed it so that this record is out before the Dead Daisies get busy again. MR That’s great. Thanks for you time. There certainly seems to be plenty to look forward to. DA Thank you, and thanks to all the fans that keep coming back. Hope to see you next year with the Daisies and hopefully Burning Rain too.